With an aim of increasing the number of permanent residents who can speak French, Canada has created a Francophone Immigration Policy Hub. I.R.C.C. 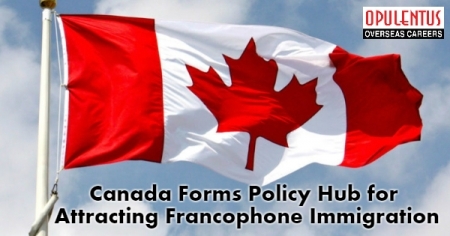 hopes that this move will permit better coordination in increasing Francophone immigration. It will improve communication between federal and provincial/territorial officials, on methods to achieve the targets of Francophone immigration. A major task of the hub is finalizing the departmental strategy to achieve the targets of Francophone immigration. It is working with the aim of increasing the number of immigrants who can speak French, outside Quebec to 4.4 percent of the total immigrants. The target is for doing this before 2023. PM Trudeau announced that the government has a plan to spend an additional $40.8 million in the next five years regarding Francophone immigration. Ahmed Hussen, Immigration Minister stated that the department has a commitment to work in collaboration with Francophone institutions and organizations. This will ensure that the immigration strategy is a reflection of the need of Francophone communities residing in areas other than Quebec. Under this, a few high-skilled workers, having ability in French language, get an exemption from the requirements of Labor Market Impact Assessment. Moreover it is a specific stream managed by the International Mobility Program and is used to support a permanent job offer in Express Entry. From June 2017, up to 30 extra Canada Express Entry points are available for candidates who possess strong skills in French language. An annex to the announcement of Canada-Ontario Immigration Agreement in April 2018 focuses on greeting French-speaking immigrants to this province. Ontario also conducts weekly draws in the French-Speaking Skilled Worker stream. There are several provincial immigration programs in the country which have an aim to fast-track candidates speaking French. Through Promotion of awareness regarding such immigration opportunities, settlement services and pathways to potential applicants speaking French. Finally, providing necessary Support Francophone communities which are diverse and inclusive. Also increased participation of immigrants speaking French in social networks and communities. In 2016 there was a shortfall of the Francophone immigration numbers in the target of the federal government. Only 4,400 - immigrants speaking French, barely 1.8 percent of total, settled outside Quebec, in spite of initiatives and policies to increase their numbers.